Dragon Quest XI: Echoes of an Elusive Age[c] is a role-playing video game developed and published by Square Enix. An entry in the long-running Dragon Quest video game series, it was released in Japan for the Nintendo 3DS and PlayStation 4 in July 2017, and worldwide for the PlayStation 4 and Microsoft Windows in September 2018. An enhanced port for the Nintendo Switch, titled Dragon Quest XI S, will also be released in late 2019. While many critics considered Dragon Quest XI to be the best entry in the series, as well as one of the best contemporary JRPGs overall, many others had criticism over its overly traditional design. By November 2018, the game had shipped over four million copies worldwide. Dragon Quest XI continues the gameplay of previous games in the series, in which players explore worlds and fight against various monsters, including the ability to explore high areas. The Nintendo 3DS version features a different style to the other versions, showcasing 3D graphics on the top screen and 16-bit styled sprites on the bottom screen. Before entering battle, players can also toggle between the 3D and 2D graphical styles at any time. Like with Dragon Quest IX, on land the game's battle system features no random encounters and shows all enemies on the overworld. The battle system also adds a free-form camera option inspired by the MMORPG Dragon Quest X that allows players to move around the enclosed battlefield, although it is purely visual and provides no other benefits to gameplay. The game is set in the world of Erdrea, and begins as the kingdom of Dundrasil is invaded and destroyed by an army of monsters. The protagonist, an infant during the attack, is among those who attempt to escape, but becomes separated and ends up floating down a river and is found by an old man known as Chalky in the village of Cobblestone. Being adopted by his daughter, Amber, the protagonist is then raised in the village. As a teenager, he eventually participates in a coming-of-age tradition by climbing the mountain Cobblestone Tor with his childhood friend Gemma. During the trek, they are attacked by monsters and while fighting to protect Gemma, a mark on his hand glows, allowing him to summon lightning to defend themselves. Upon returning, Amber reveals the truth to him about his birth and adoption, and sends him to meet king Carnelian of Heliodor. However, upon meeting him and his royal knights Sir Hendrik and Sir Jasper, the protagonist is thrown into the kingdom's dungeons under the accusation that he is the Darkspawn, a evil being predicted to destroy the world. Once imprisoned, he meets a thief called Erik who recognizes the mark on his hand, calling him the Luminary, a legendary hero chosen by the world tree Yggdrasil to save Erdrea from evil, and says he was fated to meet up with him. The pair then escape by using a tunnel Erik dug, and evade capture from Hendrik and Jasper. In a town called Hotto, the pair meet two mages who hail from the city of Arboria: Veronica, who fell into a curse that transformed her body into that of a child's, and her twin sister Serena. The two immediately recognize him as the Luminary and swear their allegiance to him, as is their sworn duty. The four then set on a quest to reach Yggdrasil so that the Luminary can understand more about his destiny. On the way, they gain three other companions: Sylvando, a traveling entertainer, Rab, former king of Dundrasil and the protagonist's grandfather, and Jade, exiled princess of Heliodor who helped the infant protagonist escape during the attack of Dundrasil. The party eventually arrives at the heart of Yggdrasil, which contains the Sword of Light, the Luminary's destined weapon. However, just as the Luminary is about to take it, he and the party are intercepted by Jasper, Carnelian and Hendrick. It is then revealed that Carnelian was possessed the entire time by an evil being known as Mordegon, otherwise known as the Lord of Shadows, and that Jasper has been an agent of his. The two then subdue Hendrik and the Luminary's party, with Mordegon taking and corrupting the Sword of Light and absorbing the heart of Yggdrasil for himself, destroying the tree and plunging the world into an age of darkness. Separated from his companions, the Luminary is revealed to have been rescued by mermaids from the underwater kingdom of Nautica, where he learns that since the fall of Yggdrasil, Mordegon sent his forces to terrorize Erdrea. Upon leaving Nautica, the Luminary returns to Cobblestone, now turned into a fortified refuge for Heliodor citizens led by Carnelian and Hendrik, who apologize to the Luminary for all the troubles they caused him. Hendrik then joins forces with the Luminary, and together, they reclaim Heliodor from Mordegon's forces, which brings back the sun. On their journey to save other parts of the world, they reunite with the rest of the party except for Veronica, where they discover that she perished saving the others during the fall of Yggdrasil. At Arboria, the party learns about a huge flying whale, called Cetacea. Using it, they travel to an ancient floating island known as Havens Above, where they discover the means to forge a new Sword of Light. After forging it, the party eventually take to Fortress of Fear, Mordegon's flying fortress. There, the party defeats Jasper, who has turned into a demon, and Mordegon himself, which restores Yggdrasil and the world. A few days after their victory, the party gathers at Arboria to celebrate and pay their respects to Veronica. Following that, the party investigates some mysterious ruins, where they discover an ancient relic that gives them access to the Tower of Lost Time. At the tower, the Luminary is told by the Timekeeper, the spirit who guards the tower, about the opportunity to go back in time to save Veronica and all others who had died during the fall of Yggdrasil. Making the tough decision to leave his current party, the Luminary does so, and defeats Jasper and Mordegon before he has a chance of stealing the Sword of Light and Yggdrasil's heart again. However, due to Mordegon's absence, a dark spirit is able to summon an evil monster known as Calasmos, which was previously thwarted in the timeline of Mordegon's rule. The party then seeks counseling of Havens Above's sages, who lead them on a quest to learn the truth regarding Calasmos' return. By doing so, they discover that a Luminary from ages ago, called Erdwin, was betrayed and killed by his mage companion Morcant, who absorbed Calasmos's powers and transformed into Mordegon from his desire of power. Serenica, Erdwin's former sage companion and lover, then sealed the weakened Calasmos and attempted to return to the past at the Tower of Lost Time, but was turned into the Timekeeper instead, as only one with the mark of the Luminary can use the tower's powers. After making their preparations, the party sets out to confront Calasmos and defeat him once and for all. Doing so, the Luminary entrusts his mark to the Timekeeper, who returns to her original form as Serenica, and uses it to return to the past and reunite with Erdwin. Accompanied by Veronica and Serena, he also returns the Sword of Light to Yggdrasil, who reveals itself as the Yggdragon, an ancient dragon who was defeated by Calasmos ages ago, with its body transforming into the tree Yggdrasil and giving life to Erdrea. The Yggdragon bestows upon the Luminary the title of "Erdrick", the mightiest of all heroes, and keeps the Sword for the day when a new hero will need it to defend Erdrea from evil. In the mid-credits, Serenica reunites with Erdwin in the past, while after the credits, a young mother, after reading the Luminary's story in a book, wakes up her child from bed, setting up the beginning of Dragon Quest III. Dragon Quest XI started development in 2013, with it being announced in 2015 for the PlayStation 4, Nintendo 3DS, and Nintendo Switch. It was one of the first games announced for the Switch, which was known under the codename of Nintendo NX as it had not been fully revealed at the time. Initially, the team considered making the game fully open world, but decided against it as it would have led to issues telling its story. The PlayStation 4, Windows, and Switch versions use the Unreal Engine 4 game engine and had developmental assistance from ORCA Inc, while the 3DS version had assistance from Toylogic Inc. In April 2017, Square Enix held a special presentation for the game, where the release date for the PlayStation 4 and 3DS versions of the game in Japan was revealed to be July 29, 2017. The same month, Sony Interactive Entertainment and Nintendo unveiled special editions of their PlayStation 4 Slim and New Nintendo 2DS XL hardware for Japan to tie into the game. Coinciding with the release, lead designer and scenario writer Yuji Horii announced that an international version, localized in five separate languages, would be released in 2018. The exact date was later revealed to be September 4, 2018, along with a version for Microsoft Windows via Steam, a first for the main series. It includes voiced English dialogue, a first-person camera option, support for 4K resolution, and an additional "Draconian Quest" hard mode difficulty feature, among other minor changes. Square Enix stated they wanted to expand the Dragon Quest brand outside of Japan, which they believed that these features, in addition to having a Windows version, would assist it. The international PlayStation 4 release also saw a special collector's edition, titled Edition of Lost Time, which includes the base game, a set of bonus in-game items, a 128-page hardback art book featuring original character design concepts from Akira Toriyama, a two-disc soundtrack featuring orchestrated versions of the game's music by Koichi Sugiyama, a cloth map of the game's world, and a steelbook case. The 3DS version was not localized outside of Japan, while the Switch version was delayed while the team updates it to a newer version of the Unreal engine that the system supports. The Switch version was re-announced at Tokyo Game Show 2018. Known as Dragon Quest XI S: Echoes of an Elusive Age - Definitive Edition, it will be released worldwide in 2019 and feature Japanese voice acting, a 16-bit graphical mode adapted from the 3DS version, an orchestral music option, and new plot elements. 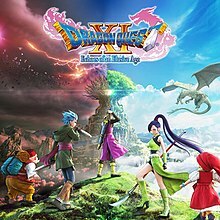 Dragon Quest XI received "generally favorable reviews" according to review aggregator Metacritic, with critics praising it for its visuals, traditional turn-based combat, plot, and characters. Multiple publications called it the best game in the Dragon Quest series, as well as one of the best contemporary JRPGs. Kotaku's Tim Rogers, a long-time player of the series, called it one of the best games of all time. GamingBolt wrote that it displayed a great command of the "ins and outs of its genre" the way few other games did. USgamer considered the game to be the natural followup to Dragon Quest VIII, the last main-series console game to be released outside of Japan, and an ideal entry point for newcomers to the series. PC Gamer praised the English localization, calling it "the most brilliant, underappreciated writing of the year". The game sold two million copies on its first two days of sale in Japan; the Nintendo 3DS version sold 1.13 million, while the PlayStation 4 version sold 0.95 million. By November 2017, the game had sold over three million copies across the PlayStation 4 and 3DS. In North America, the game had the best launch month in series history, doubling the dollar sales of the previous best, Dragon Quest IX. By November 2018, it had shipped over four million copies worldwide. ^ Additional development support by Orca. The 3DS version had assistance by Toylogic. ^ Dragon Quest XI S was published outside of Japan by Nintendo. ^ Okamoto, Hokuto. "Dragon Quest XI: Echoes of an Elusive Age Journeys West September 4". PlayStation Blog. Retrieved March 29, 2018. ^ Sato (January 4, 2017). Akira Toriyama Talks About His Work As A Character Designer For Dragon Quest. Siliconera. Archived from the original on January 5, 2017. Retrieved January 4, 2017. ^ a b Sato (July 28, 2015). "Dragon Quest XI Announced For PlayStation 4, And Nintendo 3DS". Siliconera. Archived from the original on July 28, 2015. Retrieved July 29, 2015. ^ Sato (July 28, 2015). "Dragon Quest XI's First 3DS Footage Shows Its 2D And 3D Styles". Siliconera. Archived from the original on July 28, 2015. Retrieved July 29, 2015. ^ Sato (July 30, 2015). "Dragon Quest XI On 3DS Won't Simultaneously Play In 3D And 2D For The Entire Game". Siliconera. Archived from the original on July 30, 2015. Retrieved July 30, 2015. ^ Williams, Mike. "Dragon Quest XI Is a Comfortable Callback to an Older Style of JRPG". US Gamer. Retrieved August 1, 2018. ^ Sato (July 30, 2015). "Dragon Quest XI Shows A Glimpse Of Its Fields And Battles On PlayStation 4 And 3DS". Siliconera. Archived from the original on August 1, 2015. Retrieved July 30, 2015. ^ Meister, Rich. "Dragon Quest XI's western release is adding a lot more than English voice acting". Destructoid. Retrieved August 1, 2018. ^ Byford, Sam. "Dragon Quest XI is coming to PS4, 3DS, and Nintendo NX". The Verge. Retrieved December 18, 2018. ^ Arnold, Cory (August 21, 2016). "Dragon Quest XI confirmed for NX, simultaneous launch with PS4 and 3DS versions suggested". Gematsu. Archived from the original on August 22, 2016. Retrieved August 21, 2016. ^ Tach, Dave. "Dragon Quest 10 and 11 are the first known Nintendo NX games (update)". Polygon. Retrieved December 18, 2018. ^ a b "Square Enix Re-Announces Dragon Quest XI S for Switch". USgamer.net. Retrieved September 23, 2018. ^ Sato. "Square Enix Initially Considered Making Dragon Quest XI An Open-World Game". Siliconera. Retrieved January 25, 2018. ^ "シリーズ最新作 「ドラゴンクエストXI　過ぎ去りし時を求めて」 発売決定のお知らせ" (in Japanese). Square Enix. Archived from the original on January 3, 2016. Retrieved January 30, 2016. ^ Romano, Sal (March 21, 2017). "Dragon Quest XI Japanese Release Date Presentation set for April 11". Gematsu. Archived from the original on March 26, 2017. Retrieved March 25, 2017. ^ "Dragon Quest XI Releases July 29 In Japan For PlayStation 4 And Nintendo 3DS". Siliconera. April 10, 2017. Archived from the original on April 11, 2017. Retrieved April 11, 2017. ^ "Dragon Quest XI for PS4, 3DS launches July 29 in Japan - Gematsu". Gematsu. April 11, 2017. Archived from the original on April 12, 2017. Retrieved April 11, 2017. ^ "'Dragon Quest XI' spawns the best and worst special edition consoles". Engadget. Archived from the original on April 28, 2017. Retrieved April 29, 2017. ^ Skrebels, Joe. "Dragon Quest 11: PS4 and PC Release Date Announced, Switch Coming 'Much Later', No 3DS Version". IGN. Retrieved March 28, 2018. ^ Bailey, Kat. "Dragon Quest XI PC Will Support Native 4K, Learn From Nier: Automata's Problems". US Gamer. Retrieved April 15, 2018. ^ a b Barnett, Brian. "Dragon Quest XI: Echoes of an Elusive Age Release Date Collector's Edition". IGN. Retrieved July 3, 2018. ^ Frank, Allegra. "Dragon Quest 11 aims for Monster Hunter: World's Western success". Retrieved August 1, 2018. ^ Romano, Sal. "Dragon Quest XI 'Edition of Light' and 'Edition of Lost Time' special editions announced". Gematsu. Retrieved June 12, 2018. ^ Romano, Sal. "Dragon Quest XI for Switch delay due to outdated Unreal Engine 4". Gematsu. Retrieved April 8, 2018. ^ "Dragon Quest XI S launches in 2019 in Japan, teaser trailer". Gematsu. Retrieved December 22, 2018. ^ Statt, Nick. "Dragon Quest XI S is coming to the Nintendo Switch this fall with 8-bit graphics option". The Verge. Retrieved February 14, 2019. ^ Statt, Nick (February 13, 2019). "Dragon Quest XI S is coming to the Nintendo Switch this fall with 8-bit graphics option". The Verge. Retrieved February 14, 2019. ^ a b "Dragon Quest XI: Echoes of an Elusive Age for PlayStation 4 Reviews". Metacritic. Retrieved September 7, 2018. ^ a b "Dragon Quest XI: Echoes of an Elusive Age for PC Reviews". Metacritic. Retrieved November 23, 2018. ^ Carter, Chris (August 28, 2018). "Review: Dragon Quest XI: Echoes of an Elusive Age". Destructoid. Retrieved August 28, 2018. ^ Patterson, Mollie (August 28, 2018). "Dragon Quest XI: Echoes of an Elusive Age review". EGM. Retrieved August 28, 2018. ^ Romano, Sal (August 8, 2017). "Famitsu Review Scores: Issue 1497". Gematsu. Retrieved August 28, 2018. ^ Wallace, Kimberley (August 28, 2018). "Dragon Quest XI: Echoes of an Elusive Age". Game Informer. Retrieved August 28, 2018. ^ Faulkner, Jason (August 28, 2018). "Dragon Quest 11 Review – A Tradition Continues". Game Revolution. Retrieved August 28, 2018. ^ a b Kemps, Heidi (August 28, 2018). "Dragon Quest XI: Echoes Of An Elusive Age Review - Back To The Good-Old Days". GameSpot. Retrieved August 28, 2018. ^ a b Petty, Jared (August 28, 2018). "Dragon Quest XI: Echoes of an Elusive Age Review". IGN. Retrieved August 28, 2018. ^ a b Schilling, Chris (September 11, 2018). "Dragon Quest 11: Echoes of an Elusive Age review". PC Gamer. Retrieved September 11, 2018. ^ a b c Oxford, Nadia (August 28, 2018). "Dragon Quest XI: Echoes of an Elusive Age Review". USgamer. Retrieved August 28, 2018. ^ a b c GameCentral (September 7, 2018). "Dragon Quest XI review – pretty old-fashioned". Metro. Retrieved September 11, 2018. ^ Robinson, Martin (August 28, 2018). "Dragon Quest 11: Echoes of an Elusive Age review - a staunchly traditional return for the stately RPG series". Eurogamer. Retrieved August 31, 2018. ^ a b c Parijat, Shubhankar (August 28, 2018). "Dragon Quest XI: Echoes of an Elusive Age Review – A Blueprint For JRPGs". GamingBolt. Retrieved August 31, 2018. ^ Rogers, Tim (September 4, 2018). "Dragon Quest XI: The Kotaku Review". Kotaku. ^ Fenlon, Wes. "Dragon Quest 11's localization is the most brilliant, underappreciated writing of the year". PC Gamer. Retrieved December 18, 2018. ^ Jenni (September 24, 2018). "Dragon Quest XI Mod Replaces Midi Music With The Orchestral Overhaul". Siliconera. Retrieved September 26, 2018. ^ Parkin, Jeffrey (August 28, 2018). "Dragon Quest 11 review". Polygon. Retrieved August 31, 2018. ^ Wilde, Tyler; Walton, Jarred; Fenlon, Wes (September 4, 2018). "Dragon Quest 11's PC port is barebones, but it looks great anyway". PC Gamer. Retrieved September 11, 2018. ^ 『ドラゴンクエストXI　過ぎ去りし時を求めて』発売2日間で208.1万本を販売. Famitsu. August 2, 2017. Retrieved August 2, 2017. ^ Sinclair, Brendan (November 8, 2017). "New Dragon Quest, old Final Fantasy drive Square Enix growth". GamesIndustry.biz. Retrieved October 9, 2018. ^ Workman, Robert (October 24, 2018). "'Dragon Quest 11' Has the Biggest Launch in Series History". ComicBook.com. Retrieved October 25, 2018. ^ Romano, Sal (November 6, 2018). "Dragon Quest XI: Echoes of an Elusive Age shipments and digital sales top four million". Gematsu. Retrieved November 7, 2018. ^ Watts, Steve (July 5, 2018). "Resident Evil 2 Wins Top Honor In E3 Game Critics Awards". GameSpot. Retrieved November 20, 2018. ^ Hoggins, Tom (September 24, 2018). "Golden Joysticks 2018 nominees announced, voting open now". The Daily Telegraph. Retrieved November 20, 2018. ^ Senior, Tom (October 26, 2018). "Vote for the ultimate game of 2018 in the Golden Joystick Awards". PC Gamer. Retrieved November 25, 2018. ^ McWhertor, Michael (November 13, 2018). "The Game Awards 2018 nominees led by God of War, Red Dead Redemption 2". Polygon. Retrieved November 20, 2018. ^ Glyer, Mike (November 19, 2018). "2018 Gamers' Choice Awards Nominees". File 770. Retrieved January 13, 2019. ^ Makuch, Eddie (January 10, 2019). "God Of War, Spider-Man Lead DICE Awards; Here's All The Nominees". GameSpot. Retrieved January 13, 2019. ^ "Nominee List for 2018". National Academy of Video Game Trade Reviewers. February 11, 2019. Retrieved February 14, 2019. This page was last edited on 14 March 2019, at 02:24 (UTC).